It’s that time of year when college basketball is starting to crank up again, both men’s and women’s. 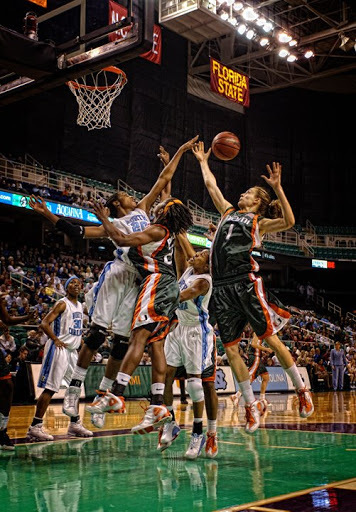 This image was from the Women’s ACC Basketball Tournament from a couple of years ago in Greensboro. UNC versus Miami. And believe me, women’s basketball is starting to reach the level of the men’s game. I like shooting sports and I do get the occasional game to shoot. Must say I have been run over a couple of times on the baseline. It’s always important to shoot with both eyes open. Dan, are you running these through HDR or just adding shadow/highlight detail? I really like the effect. I see it in a lot of your shots and it adds an extra dimension that I really like. On some of my stuff I use a little tonal contrast processing. I use a couple of plugins, Niks and LucisArts. A little can go a long way.